Future articles in the series will cover maintenance and service, bike training and racing for triathletes, bike handling and technique, and the theory of speed, resistance, and aerodynamics. Bonus Download: The Top-5 Best Resources for triathletes for cycling gear and equipment. A traditional road bike is the type of bike that’s used in pure cycling races. 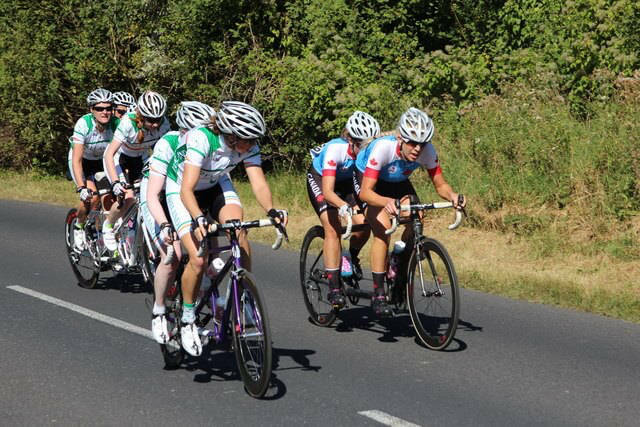 If you see a group of cyclists riding in a pack they’re most likely riding road bikes. Road bikes are designed to provide great maneuverability and responsiveness and efficient transfer of energy from your working muscles to the pedals and the rest of the drivetrain. 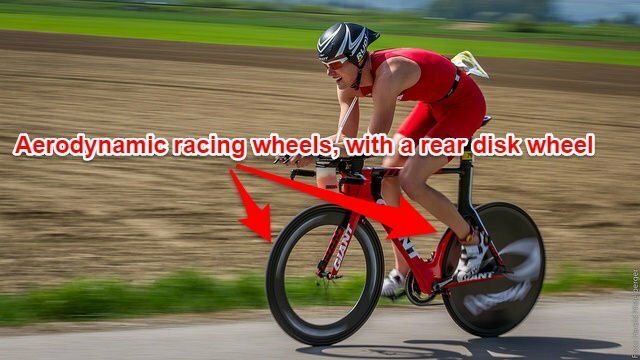 For most people, the riding position on a road bike is more comfortable than on a triathlon bike. The image below shows the geometry of a road bike. 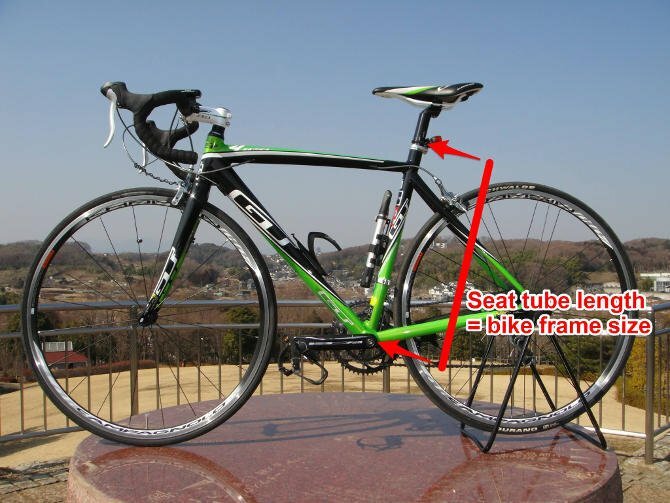 The seat tube angle of a road bike is around 72 degrees. Traditional handlebars with hoods (the upper parts of the handlebar) and drops (the lower parts) also set road bikes apart from triathlon bikes. For beginners new to triathlon, getting a road bike is a good choice to get started. Road bikes are easier to ride than triathlon bikes, less expensive, and in contrast to triathlon bikes, they allow you to take part in any event you like. Draft-legal or non-draft races, group rides, road cycling races and so on. 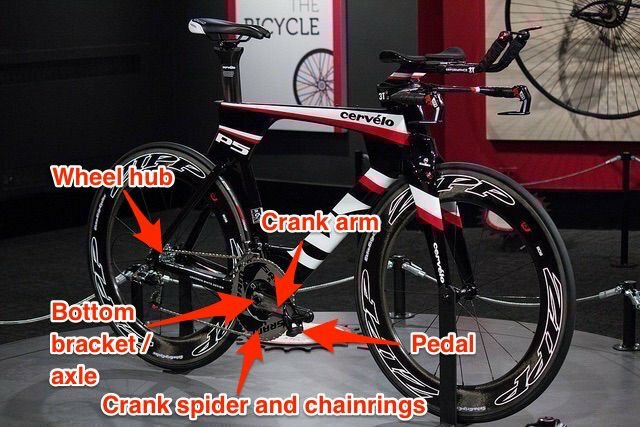 Triathlon-specific bikes have a different geometry and different handlebars to road bikes. 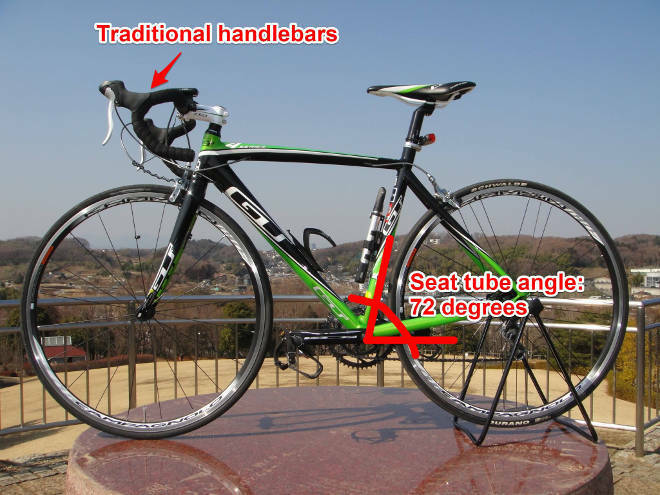 The seat tube angle is 78 degrees or more and aerodynamic handlebars, or aerobars, are used instead of traditional handlebars. The reason is that in many triathlon events (like Ironman), drafting is not allowed on the bike. When that’s the case, aerodynamics become a huge factor in speed on the bike. The triathlon bike geometry allows for a streamlined, flat-back position that minimizes aerodynamic drag. The increased seat tube angle makes it possible to achieve a similar hip operating range as on road bikes despite the flat-back position. 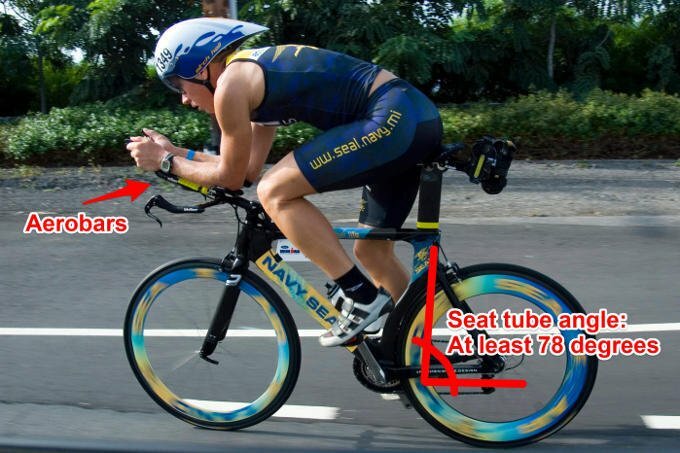 Some triathlon bikes use even steeper seat tube angles (e.g. 81 degrees). Research has shown that this reduces the use of hamstring muscles on the bike (link to study). This, in turn, can improve running performance off the bike (by 2.3 minutes over the first 5 km in a 10 km run according to this study). Finally, the frame itself of a triathlon bike is designed for aerodynamics. Road bike frames, on the other hand, are designed for maneuverability and responsiveness. Having a bike of the correct size is critical. Bike sizes are usually measured as the length of the seat tube — from the center of the bottom bracket to the top of the seat tube. If it only were that simple. There are some alternative definitions out there, and some manufacturers measure the frame size slightly differently than others. That’s why you should always check what frame size is right for you specifically for each bike brand. What’s more, you should never buy a bike based on the frame size as measured by the seat tube length alone. The length of the top tube and the head tube are equally important. Together, these three lengths form a bike geometry that may or may not be suitable to your anatomy. See this excellent video by the Global Cycling Network for more information. Always sit on a bike and ride it before buying it. A proper bike fit is a must. Period. Cycling is an extremely repetitive sport, and if you don’t have a good bike fit you’ll seriously put yourself at risk for an overuse injury. And you’ll also compromise your cycling performance. Doing a bike fit involves adjusting the saddle height, saddle fore and aft position, saddle tilt, stem length, handlebar height and cleat position on your shoes. Bike fitting involves balancing comfort and performance. For beginners, it’s recommended to stray on the side of comfort. You can then do small incremental adjustments to gradually get used to a more aggressive riding position optimized for performance. Recommendations of experienced triathletes, cyclists and coaches (ask around at your local triathlon club). I know that there’s always a segment of people that don’t want to spend the extra money on getting a bike fit. Luckily for you, bike fitting is not an all-or-nothing matter, where nothing less than a pricey professional fit will give you any advantage. It is possible to get at least a half-decent fit yourself. Yet another excellent video (just three and a half minutes!) by the guys at Global Cycling Network. Bike fit calculator by Competitive Cyclist based on your anatomical measurements. This one is a bit more detailed (see the images below), but on the other hand, it’s only as good as the accuracy of your input measurements. The most common bike frame materials are aluminum and carbon fiber. Steel and titanium frames can also be found on some bikes. Aluminum bikes are durable, affordable and lightweight for their price point. My recommendation to beginner triathletes is without a doubt getting an aluminum bike. The downside of aluminum is its stiffness compared to other materials, which makes for slightly rougher rides. When the time comes to upgrade to a better bike, carbon fiber is the obvious choice for pretty much everybody in the triathlon cycling circuit. It’s lightweight, makes for high comfort and responsiveness, but it comes at a higher price point. Get a road bike with an aluminum frame. It can be new or used but in good condition. Have somebody knowledgeable evaluate used bikes you’re considering. Make sure you get to try it and have somebody in the know evaluate whether it’s the right size for you. Get a bike fit by a professional in your local area. Ask at your local triathlon or cycling club for recommendations. Get the rest of the necessary equipment if you don’t already have it. No need to get anything fancy — basic equipment will do. You’ll want to get a new helmet, but for the rest of the stuff, you could save some money by buying it second-hand. Cycling jersey (with pockets on the back for keeping small necessities like keys, phone nutrition, spare tube etc.) on rides. You’re all set to get started with triathlon cycling. All without spending a fortune. If you get bitten by the bug, you can sell off this first bike and get a better one later when you’ve learned more about triathlon and cycling, and have a better idea of your wants and needs. Bike wheels come in many different varieties. Each kind of wheel has its specific set of attributes, and should be used for specific purposes. Some wheels are designed for training, others for racing in various condition, like different wind conditions or on different course profiles. Wheels come in two basic sizes: 700C (622 mm rim diameter) and 650C (571 mm rim diameter). 700C is the more commonly used size. That said, 650C wheels are becoming more and more common, particularly among triathletes, smaller riders and women. The advantage of smaller wheels is that they’re lighter, so climbing and accelerating becomes easier. They may also be easier to handle in crosswinds. The disadvantage is an increased rolling resistance. The most important thing to consider when choosing a wheel size is handling. If your bike handling is improved with one size over the other, go with that size. 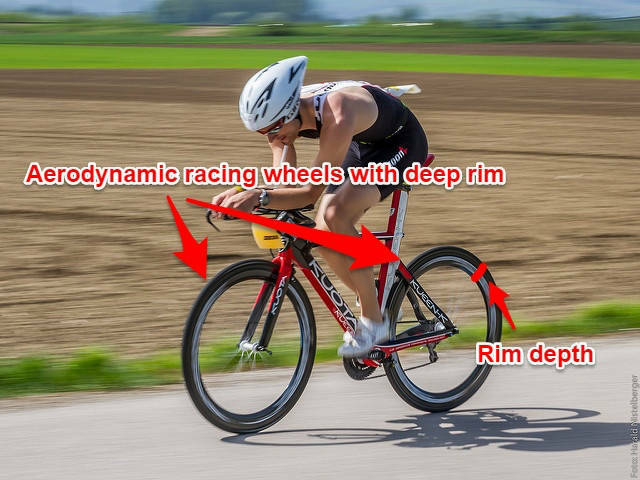 The aerodynamic performance of bike wheels is always a hot and continuously evolving topic. How “aero” a wheel is depends on the depth of its rim (up to 40 mm is considered a mid section rim, above 40 mm is deep section rim) and whether it has regular round spokes, more aerodynamic bladed spokes, three wide (very cool-looking!) spokes (three-spoked) or even no spokes at all — disk wheels. 3-spoked wheels perform similarly to disk wheels (see images below), but are less sensitive to crosswinds. The weight of a wheelset affects climbing and accelerating. Heavier wheels make climbing and accelerating more demanding. When choosing bike wheels you have to consider the terrain and conditions you’ll ride and race in since there’s a trade-off between aerodynamics and weight. For example, disk wheels are excellent on flat courses for their aerodynamic performance, but on very hilly courses their weight will offset any aerodynamic advantages it offers, so it’s better to go with a lighter set of wheels. Sturdier and heavier wheels with more spokes are more durable than their lightweight racing wheel counterparts with fewer spokes. Regular training wheels typically have 32 to 36 spokes, whereas racing wheels may have as few as 16 (front) or 24 (rear) spokes. For training, use a set of durable wheels that can handle the amount of training you do. Regular spoked wheels without any semblance of aerodynamic rim profile will do just fine. For racing, however, specific wheels made for racing might be something to consider. Click any of the images ﻿to﻿ zoom! Don’t worry about getting multiple sets of wheels when starting out. You’ll be fine with just the training wheels that come with your bike. This means you shouldn’t invest in racing wheels before you’ve invested in way more beneficial things like coaching, physiotherapy and massage if needed, bike fit, great nutrition etc. Once you have all that, you’ve got the go-ahead to go and get a set of racing wheels. There are two types of tires commonly used in road and triathlon cycling. Clincher tires are the standard tires in cycling. They have a separate inner tube. Clinchers are durable, easy to repair and replace in case of flats, and cheap. Ideal tires for training. Tubulars are lighter, can be inflated to higher pressure for decreased rolling resistance and provide better cornering grip due to their perfectly round cross section. This makes them the tire of choice for many professionals. However, tubulars are expensive and difficult to install and repair. They are literally glued to the rim, and the very thin tube inside must be sewn back together with the tire in case you get a flat. In practice, this process is so time-consuming that you’re better off carrying a spare tire than just a repair kit when riding tubulars. Ride clinchers in training. And in racing, if you’re not necessarily looking to cut every second possible off your race time. If you do want to optimize race performance, have a look at tubulars. The rolling resistance of the contact surface between your tires and the road is very much dependent on tire pressure. Inflate the tires too little or too much and the rolling resistance increases. And this, in turn, means you’ll spend unnecessary energy to overcome this increased rolling resistance. "On the most freshly compacted asphalt, the optimal tire pressure for a 170-pound athlete was 110 psi." The road surface heavily impacts optimal tire pressure. For example, over torn-up pavement Poertner and his team found that the optimal pressure was as low as 65 psi! On normal, coarse asphalt around 95 psi was found to be optimal. 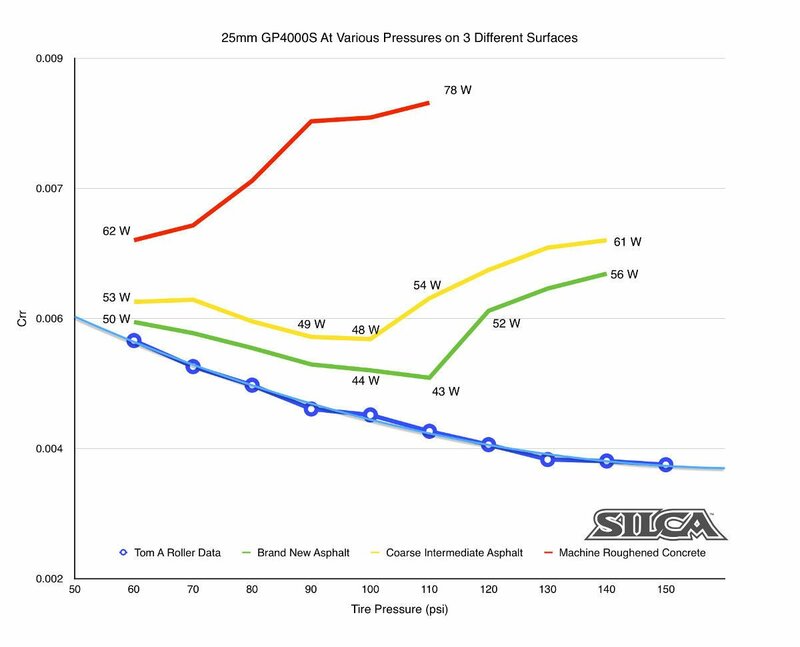 Image courtesy of Joshua Poertner, Silca. Importantly, the decrease in performance when tire inflation passes a certain “breakpoint pressure” is very steep. So err on the side of under-inflating rather than over-inflating! 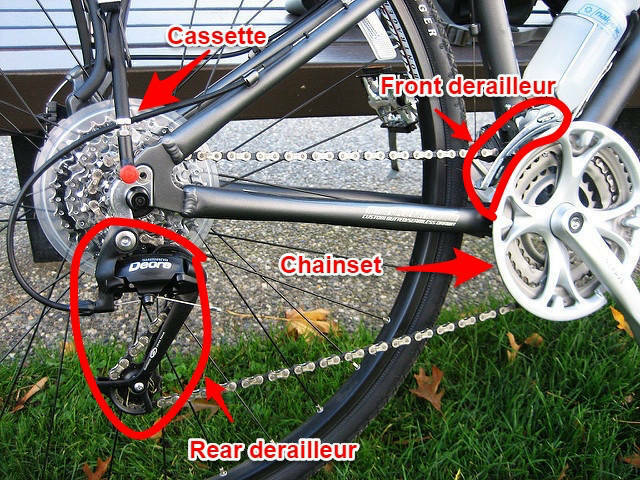 The bike groupset consists of brakes and the gear setup components: shifters, chain, chainset and front derailleur (front gears), and cassette and rear derailleur (rear gears). There is a wide range of groupsets available. The main differences between an entry level groupset and more expensive groupsets are that the fancier groupsets have lighter components and smoother shifting. At the very high end, some groupsets have electronic shifting rather than mechanical. For beginners, an entry level groupset at the low end of the price range is perfectly fine. 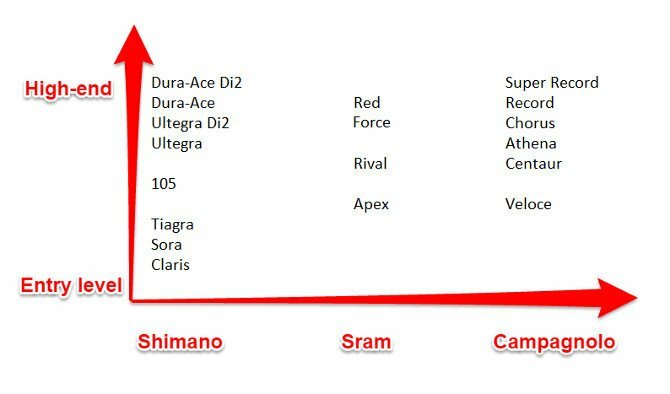 There are three main manufacturers of groupsets: Shimano, Sram and Campagnolo. The image below shows the hierarchy of each manufacturer’s groupset options from entry-level to high-end. For more information on groupsets, see this video by Cycling Weekly or read this detailed guide from Bike Radar. 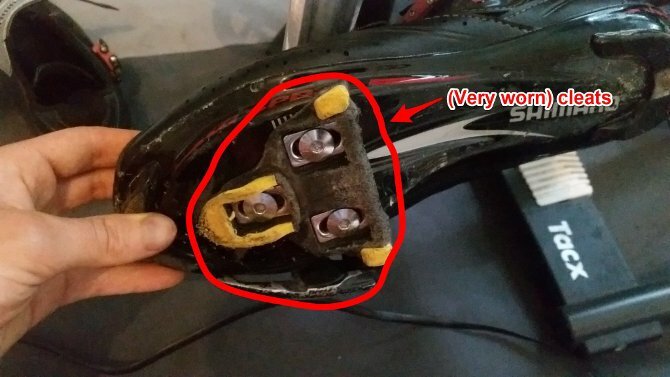 Bike shoes are designed so that cleats can be attached to their soles, and you can clip into the pedals. This really is a dealbreaker. Your shoes must feel comfortable and fit well. The stiffer the sole, the more power is transferred from your working muscles through to the pedal and less energy is lost to flex. Carbon fiber soles have excellent stiffness. But as you can imagine, better stiffness comes at a higher price. Road cycling shoes typically have either multiple velcro straps or a buckle system for tightening the fit of the shoe. Triathlon shoes on the other hand only have a single velcro strap. In addition, triathlon shoes are seamless so you can wear them without socks and still not get the blisters that you might get if you ride sockless in road shoes. This means that if your goal is to save every single second possible, you can make faster transitions using triathlon shoes. On the other hand, road shoes tend to be narrower and have a smaller amount of lateral gliding motion in the pedal clips. This may lead to less stress on certain muscles (e.g. the iliotibial band) and more efficient pedaling. I don’t need to tell you that you must wear a helmet on every single ride for your own safety. And obviously, you won’t be allowed to race without a helmet. You could even be disqualified for riding your bike without a helmet in and around the race venue before the race. For beginners, a regular helmet that fits firmly but comfortably is ideal. You don’t need to spend big bucks on your first helmet. When you get to the point where you feel buying upgrades for the sake of better performance is a good investment, an aero-helmet gives you great bang for your buck. So these time savings are actually greater than the time savings of aero wheels, for a fraction of the cost! An aero helmet is definitely the first aero-upgrade you’ll want to do when the time has come for that. You can get even more intel on aero helmets, visors, and whatnot in the Fat Black Podcast interview with Mark Cote. The main components of a triathlete’s cycling wardrobe are a cycling jersey and a pair of padded shorts. Jerseys are moisture-wicking as any technical material clothing for sports, but the real beauty of them is the big pockets on the back where you can keep pretty much everything you need for your bike rides. Keys, mobile phone, nutrition, a light rain jacket, you name it! Padded shorts are a real life-saver. Saddle soreness is no fun, and chafing in sensitive areas even less so. Save yourself a lot of suffering and get a good pair of shorts right away. In addition, gloves are a great addition to your wardrobe, even if you live in a warm climate. Holding the handlebars for long durations can easily cause blisters for some riders, and gloves help protect against that. Obviously, there’s a whole lot more that you could get. And might just have to, if you live in a colder or rainier climate. Cold-weather jacket, cold-weather tights, shoe covers, wind west, rain jacket, leg and arm warmers, to name but a few. Tight-fitting clothes is one of the best and most cost-effective investments you can make to become more aero. The men-in-lycra movement really is on to something here! There are several ways you can set up your hydration system on your bike. If you’re starting out and followed my advice about getting a road bike, the easiest and cheapest way is to just get a pair of ordinary bottle cages and water bottles and putting them on your seat tube and down tube. Depending on the type of riding and racing you do, you can add bottles almost ad infinitum. 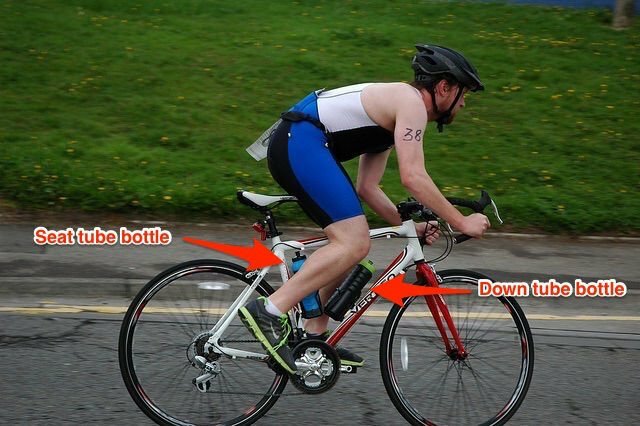 Some higher-end triathlon bikes have the option of integrating a bottle in the bike frame itself. Very aerodynamic, but it comes at a cost. Your options will depend on your bike (road bike vs. road bike with clip-on aerobars vs. tri-bike vs. tri-bike with custom frames or aerobars). Generally speaking, hydration set-up is a trade-off between aerodynamics and weight on the one hand and cost on the other. If you move up the distances to race non-draft half or full distance triathlons and start chasing personal bests, aerodynamics become an important part of the puzzle. At that point, replacing your frame mounted hydration set-up with for example an aerobar-mounted bottle and a bottle or two behind the saddle is well worth the investment. In terms of access and extra weight, it seems that the best set-up for many people will be a regular drinks bottle zip-tied between your aerobars. This is obviously applicable only if you’re riding a bike with aerobars. A saddle bag is a small but invaluable accessory for all triathletes and cyclists. 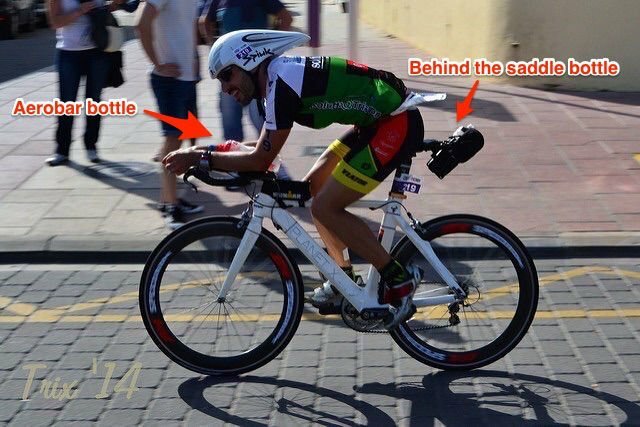 No article on bike equipment in triathlon cycling would be complete without some information on what to have in your saddle bag. Get a saddle bag right away when you first start cycling. It doesn’t much matter which one, as long as it can hold all the stuff you want to fit in it. 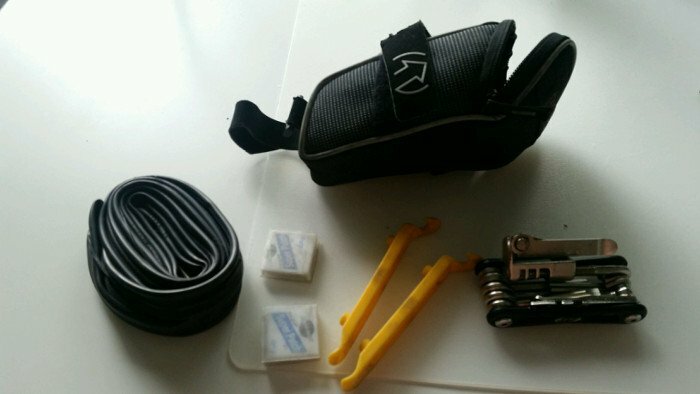 Keep everything you need to repair a flat in your saddle bag at all times and keep the bag on your bike. That way you don’t risk forgetting anything and become stranded. If you use several bikes (like a road and a tri bike), just move the saddle bag from one bike to the other before your ride. Other stuff I bring with me (like keys, phone, nutrition, pump) go in jersey pockets or on the frame. I tend to put just the things I don’t expect to need in the saddle bag and have the things I’ll need more conveniently available. But you’ll have to see what works best for you. Entire books have been written on the subject of power meters. And rightly so. It’s a topic that’s got a lot of meat to it. A power meter is probably not something to splash the cash on at the beginning of your triathlon career. The biggest benefit from power meters can be gained when your training becomes more advanced. And they really come into their own in 70.3s and Iron distance races where even small pacing mistakes can have a big impact. A power meter measures the energy applied per time unit as a result of your pedaling. So you could see for example that even though you’re speed decreases while climbing, your power output increases. You can see this clearly in the chart below. This particular “power file” is a public workout on Training Peaks from Ben Hoffman’s Ironman Hawaii 2014. It’s completely objective. It measures the work you actually do. Heart rate does not, since heart rate depends on many variables. Sleep, stress, oncoming sickness, coffee and much more. So you could have quite different heart rates on different days for the exact same power. It has no time lag. If you start climbing up a hill or suddenly turn into a headwind, it will instantly pick up changes in power. With heart rate, there is a delay where heart rate gradually increases as you go up the hill, even though your actual work and effort are exactly the same all along. And because of the previous two points the power meter is the most accurate tool available to make sure you train at the right intensity. For example, using a power meter you’ll know straight away how much to slow down when going uphill to keep the effort constant. Similarly, it is a fantastic tool in racing to make sure you pace yourself correctly. The different types of power meters measure power slightly differently. This means that the absolute numbers are not always directly comparable. That’s not an issue for training and racing purposes since you’ll compare you to yourself and the power baselines and zones you establish. a) Is the power meter compatible with your bike geometry? b) Dual or single power? That is, can it measure your left and right power separately (e.g. pedals and crank arms) or not (e.g. wheel hub). c) Can it be easily moved from one bike to another? The genesis of cleat-based and insole-type power meters is very exciting in terms of the portability of power meters. d) Does its placement cause any issues for you when cycling due to changes in geometry? A wheel hub power meter won’t change the bike geometry but a crank arm one might (even if it’s ever so slightly). Because of the very different technological and hardware requirements on all these different types of power meters, there’s also a wide price range. From in the region of $400 to upwards of $1500. Do you know for what purpose you’re buying it? Do you have a plan for how to use it in your triathlon training and racing, or do you have a coach who can analyze the data and prescribe workouts for you? Will you need to move it between several bikes? Will you need dual (left and right) power measurements? If you’ve had injury problems or imbalance issues in the past this might be a good idea. What measurement accuracy do you need from your power meter? What bikes, GPS-watches and bike computers do you need it the power meter to be compatible with? DC Rainmaker’s Power Meter Buyer’s Guide. ‘Nough said. Spring 2016 Power Meter Pricing Wars — prices are dropping with new players and innovative products entering the market. Training And Racing With A Power Meter by Hunter Allen and Andrew Coggan. If you do get a power meter, get this book too. For a free summary of the above book, get Training Peaks’ free e-book by Allen, Coggan and Joe Friel. Some of the content is specific to Training Peaks users (you can register for a free account). But importantly, it covers all the basics everybody needs to know about training with a power meter, regardless of training log platform used. There are various additional electronic gadgets that you can add to your bike. They range from simple speedometers that show you basic data like speed (duh! ), time and distance, to full-blown bike computers with all functionalities you could ever wish for and advanced integrations. If you have a Garmin or another GPS-watch you probably already get all the data that a speedometer would show you anyway. The one advantage that a speedometer does have is that you can mount it on the handlebars right in front of your eyes. No wrist-turning necessary to check how fast you’re going. If you value convenience (and safety — in steep downhills it’s best to keep your hands firmly on the handlebars at all times) this could be worth the $10 to $20 or so a cheap unit would cost. A two-part sensor (one attached to the bike forks, one to a spoke on the wheel) is what actually measures the speed and transmits the data to the handlebar-mounted computer. Many sensors also measure your cadence (revolutions per minute). If you’re in a situation where you have a sports watch and don’t necessarily need a speedometer you could still by a sensor unit that is compatible with the watch. That way you’d get the cadence data that your sports watch can’t measure by itself transmitted from the sensor to the watch. But do ask about the compatibility before buying! Bike computers, on the other hand, are a bit like advanced GPS-watches — but mounted on your handlebars. They have integrated GPS units, sync with various sensors, heart rate monitors and power meters, can show routes and directions as you ride, and lots more. This baby has got it all, including a very cool Strava segment support functionality. Price: around $300. An excellent option in the budget category at $140. It’s got all the core features that you need from a bike computer, although it lacks some of the fancy stuff that the Garmin has. Now, just remember that you don’t need a bike computer to get all the core features. A good sports watch (here’s a shout-out to the Garmin Forerunner 920 XT) will already give that to you. A simple speedometer. Optionally with a cadence sensor. Lastly, let’s talk about the indoor trainer. If you’re not familiar with what an indoor trainer is, it’s basically a sort of bike stand with a resistance roller that presses against the rear tire and adds resistance. You place your regular road or tri bike in it and can then ride on your own bike indoors. As you can imagine this is way more specific cycling training than a spin bike or stationary bike. And it’s also much more fun! You can adjust the resistance provided by the resistance roller, typically through a user interface mounted on your handlebars or directly from a computer connected to the trainer. For anybody living in colder climates where the weather prevents you from riding outside for parts of the year, an indoor trainer is a purchase you’ll eventually want to make. But even for triathletes that live in a climate where year-round cycling outside is possible, one of my top triathlon cycling tips would be to get a good indoor trainer and do some workouts on the trainer. The reason is that you can get so specific with your workouts on the trainer, down to the exact amount of watts, incline, and so on. This makes cycling on the indoor trainer highly effective and time-efficient if structured correctly. The underlying difference is how the resistance is generated. More importantly for you, fluid trainers are quieter but more expensive than magnetic trainers, and magnetic trainers have a limit on how high you can set the resistance. If you’re a beginner it’s unlikely you’ll reach that limit for quite a long while, though. There are some other kinds of trainers as well (wind trainers, roller trainers etc.) but I wouldn’t recommend any other type than a magnetic or fluid trainer. Especially for beginner triathletes. 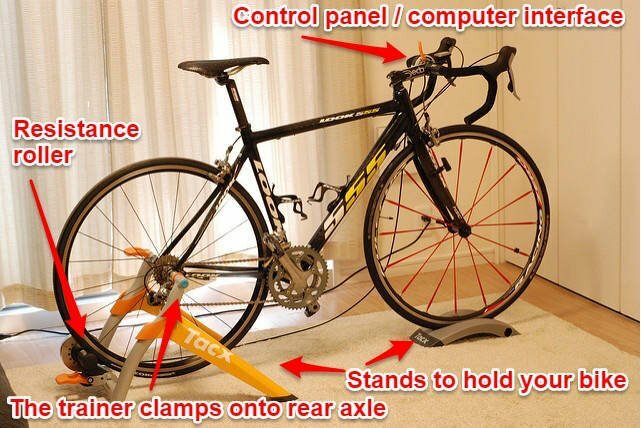 If you’re a really strong cyclist, make sure you don’t buy a trainer that will limit your training. Fluid trainers are quieter than magnetic trainers, but it all depends on what you can tolerate (and on whether you’re willing to raise the sound level of the TV to out-sound the trainer or not). Obviously. For your first trainer, you’ll be fine with a trainer in the $150 to $200 range. You’ll have the opportunity to upgrade to a (much) more expensive trainer later if you get really serious about your training. Many trainers come with software jam-packed with training modes, pre-programmed workouts, analysis tools, virtual cycling worlds, real-time online competitions with other riders and what not. Have a look at the different options and see what’s available and what you’d like to have in your trainer. I wouldn’t overemphasize fancy functionalities like this, though — you can create your own very specific training by just adjusting the resistance directly, and your own entertainment by watching TV or similar. So don’t let the software package be the main driver of your purchase decision. The go-to man in all things related to triathlon gears and gadgets DC Rainmaker recommends Tacx Satori Smart in the budget range (around €225, but apparently the US pricing is quite a bit more expensive). And if you want to spend a bit more, the Tacx Vortex Smart for €300 or $529. Damn, what’s up with these price differences??? I’ve used the Tacx iFlow myself, which is no longer available but is basically the predecessor of the Satori Smart. Based on that I can highly recommend Tacx (and probably the Satori Smart as well). That said, if you’re in Europe and can get the Vortex Smart for only 75€ more, I’d probably buy that straight away, since it really is an amazing trainer with everything you’ll need for a looong time. I only realized it was this cheap now that I researched the subject writing this, and I’ll order it straight away! Get a large fan (or at least a fan) and lots of water for your indoor workouts. It’s going to make you sweat! Get some entertainment going. Whether it be music, Netflix or hiring a stand-up comedian, cycling indoors can be tedious if all you’re doing is staring at a wall. I connect my laptop to my TV and use the “Extend screens” setting, so I can watch the workout data (in the Tacx Trainer Software) on the laptop screen and watch a TV-show or movie on my laptop or streamed from it on my TV-screen. Pro triathlete Cody Beals covers this topic in depth in this excellent article. 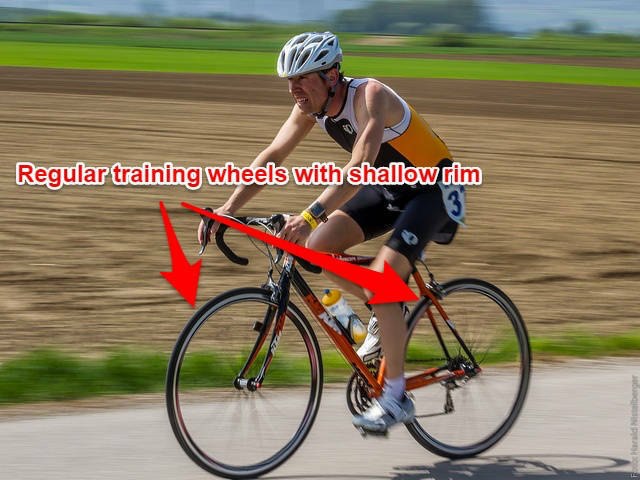 If you mastered the information in this article you’re well-equipped (pun intended) to master triathlon cycling as well. It’s important to remember that training trumps equipment by a country mile. But to even be able to train properly you need to know the fundamentals of cycling gear and equipment. Hopefully, this article has helped you with that! Part two in the Triathlon Cycling Tips series is now available here. It's all about bike maintenance. Check it out, you won't be disappointed. Almost there! Enter your name and email and click the button below to gain instant access. Get the Free Report: "The Top-5 Cycling Equipment Resources for Triathletes"